Cellular interception technology refers to the interception, tracking, recording, and storage of cellular communications such as phone calls, internet usage, SMSs, etc. Cellular interception technology is extensively adopted by law enforcement agencies and authorities such as governments, military & defense, and federal & local law enforcement agencies (LEAs). The technology is primarily used to gather intelligence regarding criminal or terrorist activities. Cellular interception devices are capable of active, semi-active, and passive interception of cellular information such as voice, metadata, and data transmissions. Vendors of such devices also offer advanced capabilities such as capturing forward and reverse cellular channels during cell phone calls. These devices can capture control channel frequencies and allow monitoring of cellular communications from cellular site stations and base stations. The device allows users to perform a seamless Man-in-the-middle attack over cellular communications, where the interception device is capable of snooping in and recording telecommunication between a cellular tower and a cellular mobile device. Cellular interception devices may be designed to be portable units that can fit within vehicles and airborne devices. Law enforcement agencies and government authorities primarily adopt CDMA and GSM cellular interception technologies. Applications of cellular interception technologies are tactical operations, and monitoring of command & control centers, borders, and airports. Rising rates of crime in cities, ranging from small time offenders to organized crime rings, have caused local law and federal enforcement agencies to invest in technologies that can help prevent, track, and neutralize such unlawful offenders. The cellular interception market is driven by the rising efforts of law enforcement agencies and government organizations in their bid to combat crime. Strategic interception systems are integrated and deployed by telecommunication providers in their networks in order to comply legally with lawful interception requests of telecommunications between users on the network. Strategic interception systems do not have an operational limit, and can detect the exact location of any phone in an intercepted conversation. The development and use of new communication channels, network and frequencies would require integration with cellular interception systems. This would lead to cellular interception systems becoming more complex and expensive to develop and implement. Deployment of newer devices to intercept such communication channels and network systems across the world is anticipated to hamper the cellular interception market in the long term. The cellular interception market is segmented based on component, technology, system type, application, and geography. In terms of component, the market has been classified into hardware, and software. By technology, the market is categorized into code-division multiple access (CDMA), global system for mobile communications (GSM), active GSM system, passive GSM system, semi-active GSM system, 3G/4G/Long-Term Evolution (LTE), satellite cellular communication system, hybrid system, and others (Universal Mobile Telecommunications System (UMTS). By system type, the cellular interception market is segmented into strategic interception system (ULIN – Unlimited Interceptor), and tactical interception system (IBIS — in-between Interception System). The market classified by application is divided into public sector and private sector. Based on geography, the market is segmented into Asia Pacific, Europe, North America, South America, and Middle East & Africa. Among these regions, North America covers a large share of the cellular interception market. This is primarily due to increasing military and law enforcement spending by the government. Middle East & Africa are anticipated to offer lucrative opportunities to the cellular interception market mainly due to governments combating increasing security threats and criminal activities. The global cellular interception market comprises a large number of international and domestic companies providing a wide range of cellular interception hardware and software. Some of the key vendors offering cellular interception components include Ability, Inc., ADS Group, Axiom Technologies Pvt. Ltd., Endoacustica Europe s.r.l., HSS Development, Netline Communications Technologies (NCT) Ltd., NovoQuad, Inc., PICSIX, Shoghi Communications Ltd., Stratign, and TheSpyPhone. The cellular interception market report provides analysis for the period 2016 – 2027, wherein the period from 2019 to 2027 is the forecast period and 2018 is the base year. The report covers all the major trends and technologies playing an influential role in the market’s growth over the forecast period. It also highlights the drivers, restraints, and opportunities for the analysis of market growth during the said period. The study provides a complete perspective on the evolution of the global cellular interception market throughout the above mentioned forecast period in terms of revenue (US$ Mn). The market overview section of the report demonstrates market dynamics such as the drivers, restraints, and opportunities that influence the current nature and future status of this market, regulations and policies, value chain analysis, and Porter’s Five Force Analysis. Further, key trend analysis included in the report highlights technological developments and their impact considerations. A market attractiveness analysis has been provided to offer a thorough understanding of the overall scenario in the cellular interception market. The report also provides an overview of various strategies adopted by key players in the market. The report segments the market on the basis of component, technology, system type, application, and geography. In terms of component, the market has been classified into hardware, and software. By technology, the market is categorized into code-division multiple access (CDMA), global system for mobile communications (GSM), active GSM system, passive GSM system, semi-active GSM system, 3G/4G/Long-Term Evolution (LTE), satellite cellular communication system, hybrid system, and others (Universal Mobile Telecommunications System (UMTS). 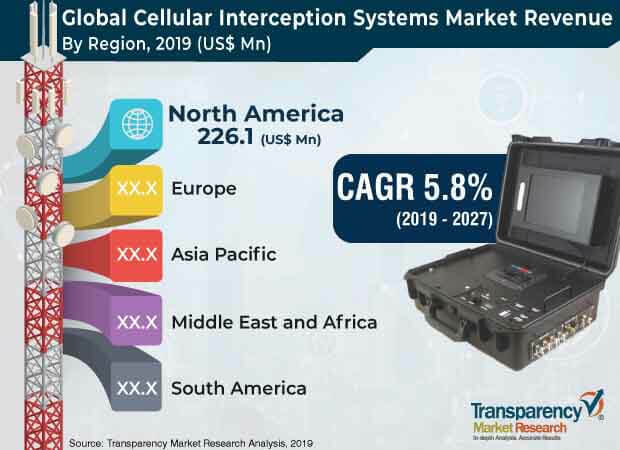 By system type, the cellular interception market is segmented into strategic interception system (ULIN – Unlimited Interceptor), and tactical interception system (IBIS — in-between Interception System). The market classified by application is divided into public sector and private sector. Based on geography, the market is segmented into Asia Pacific, Europe, North America, South America, and Middle East & Africa. The report provides in-depth segment analysis of the global cellular interception market, thereby providing valuable insights at the macro as well as micro levels. Additionally, the report highlights competitive scenario and trends in which the cellular interception market concentration rate and mergers & acquisitions, and expansions undertaken by companies are provided. The report also highlights the competitive landscape of the global cellular interception market, positioning all the major players according to their presence in different regions of the world and recent key developments initiated by them in the market. The comprehensive cellular interception market estimates are the result of our in-depth secondary research, primary interviews, and in-house expert panel reviews. These market estimates have been analyzed by taking into account the impact of different political, social, economic, and technological factors along with the current market dynamics affecting the cellular interception market growth. This report provides all the essential information required to understand the key developments in the cellular interception market, and growth trends of each segment and region. It includes basic overview, revenue, and strategy and developments under the company profile section. Also, the report provides insights related to trends and their impact on the market. Furthermore, Porter’s Five Forces Analysis explains the five forces, namely buyer’s bargaining power, supplier’s bargaining power, threat of new entrants, threat of substitutes, and degree of competition in the cellular interception market. Primary research involves telephonic interviews, e-mail interactions, and face-to-face interviews for detailed and unbiased reviews on the cellular interception market, across geographies. Primary interviews are usually conducted on an ongoing basis with industry experts and participants in order to get latest market insights and validate the existing data and analysis. Primary interviews offer first-hand information on important factors such as market trends, market size, competitive landscape, growth trends and outlook etc. These factors help to validate and strengthen secondary research findings and also help to develop the analysis team’s expertise and market understanding. Moreover, the data collected and analyzed from secondary and primary research is again discussed and examined by our expert panel. The research study includes profiles of leading companies operating in the global cellular interception market. Some of the key players profiled in the report include Ability, Inc., ADS Group, Axiom Technologies Pvt. Ltd., Endoacustica Europe s.r.l., HSS Development, Netline Communications Technologies (NCT) Ltd., NovoQuad, Inc., PICSIX, Shoghi Communications Ltd., Stratign, and TheSpyPhone.